Bazin and Field battled at the front all weekend at Charm City. 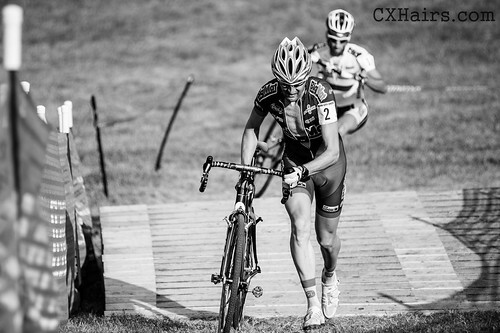 This past weekend’s Charm City Cross used to be known as opening day for Mid-Atlantic cyclocross. But with the early start this year we are already in our third week of racing of racing before making the annual trek to Baltimore, which of course means that the “first race of the season” excuse can be left at home. Sunny skies and a fast course made for ideal racing conditions at Druid Hill Park as more than 600 racers per day showed up to toe the line. The CXHairs team was out in force filming this event. Thanks to Larry Miller and Sean O’Donnell for grabbing footage and Taylor Jones for acting as my French interpreter. Although Taylor’s on camera work was left on the cutting room floor, if he was not with me when I tried to interview Saturday and Sunday winner Nicolas Bazin, even the short clip at the end of the video would not be possible. What exactly Bazin says in that mini interview? Well, you’ll have to call on your high school French to help you out. Or ask a friend. That’s what I did. Charm City Cyclocross 2012 Men’s Elite Field from In The Crosshairs on Vimeo. As always, great stuff Bill! Niiiiice video Bill. Makes me miss ‘cross. So did anyone translate the last :30? Seriously, one of the best videos yet. Great job Bill.